In Simulacra, an installation at i8 gallery from December 15th 2016 through February 11th 2017, Icelandic artist Elín Hansdóttir radically alters the gallery space and then returns it to its original state with only photographs serving as evidence. When viewers enter the gallery they see nine nearly identical photographs depicting a prosaic scene—a vase of flowers. Upon closer inspection, however, the scene becomes strange, as the flowers are depicted hovering in the center of the gallery where the building’s support column is located, literally defying gravity and logic. And as viewers scan one photograph after another the flowers seem to devolve from a state of bloom to death, as if the deterioration within a Dutch still painting has been divided into cells for a stop-motion animation film. To create this illusion Hansdóttir used techniques derived from the early years of Hollywood cinema, which she innovated for her own purposes. 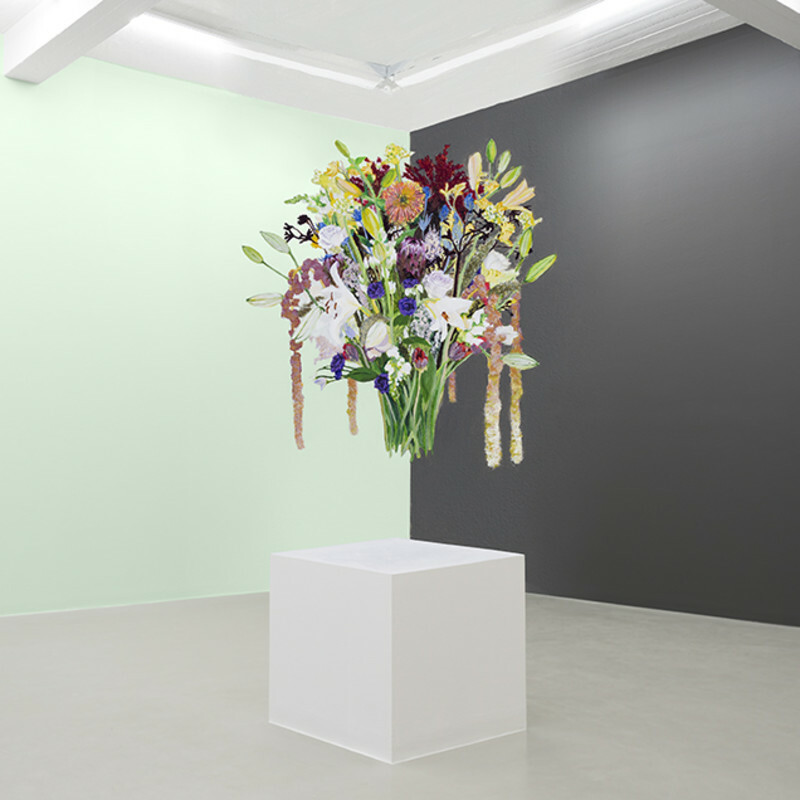 In this installation she photographed a vase of flowers over a period of one month and from these images painted glass mattes, which she installed around the gallery’s column. The artist then photographed the column, which, courtesy of the matte paintings around it, seemed to disappear. The glass mattes were then removed. Upon entering the gallery viewers will anxiously look from the photographs on the wall to the site they depict, finding only a support column in the gallery but expecting more. Whether miracle or a trick, these photographs at i8 depict an event that interrupts the scene of normality, and such events, as Alain Badiou notes, reveal the multiplicity that lies at the foundation of reality, shaking our sense of continuity. As in prior installations by this artist the viewer serves as a catalyst. In Trace (2010), for example, viewers scan the wall like a film projector, piecing together still images into a coherent narrative. Similarly, in Path (2008) viewers walk down a corridor as they attempt to assemble a host of discrete and ungrounded experiences into a phenomenological whole. And in Suspension of Disbelief (2015) Hansdóttir introduces the glass matte technique, thereby obliging viewers to composite installation with representational imagery. While she continues in this manner Simulacrais more about time than space. It is also more layered and more explicitly about history. It thus compels viewers to do a different kind of work than her previous installations do. If un lieu de mémoire is a spatial marker indicating a mnemonic absence, this installation comes at the problem of memory from multiple angles. The artist’s layered process serves as an index to the different rhythms that once infused daily life—the quick clip of stop-motion cinema, the languorous stillness of the still life painting, the “decisive moment” of photography, and the timelessness of religious symbolism. Conversely, these invoked rhythms suggest that the contemporary gallery—with its white walls, cement floor, and central support column—buries memory. Such memories reemerge in Simulacra uninvited.